Great shot! I miss chi-town!! This is absolutely stunning. I lived in Chicago 40 years ago and go back and visit occasionally. You've captured the feeling I have of the feeling along the river for me. I love how you brought out a lot of color in the buildings but still kept the cloudy gloom. Wincing, blue eyes glare down to see what hit him dropping his glare when he sees that it’s his son a small chuckle escapes his mouth when he notices the baby trying to grab at his basketball shorts. “Oi you,” he calls out. The six-month-old startles so focused was he on grabbing his fathers shorts that it takes him a second before recognition crosses his face, excited babble leaves his mouth. “Ready for food?” He questions holding up a bottle, small fingers make a grabbing motion gesturing for his father to pass him the bottle. “Nope, we learned that lesson real quick,” bending down he slips his hands underneath his son’s armpits hauling him up smirking when the baby giggles. “What are you doing?” A gruff masculine voice questions taking in your appearance, “What’s it look like I’m doing?” You mumbled around a mouthful of shepherd’s pie an irritated expression crosses your face daring your husband to tread carefully you stare shamelessly at his bare chiseled chest and washboard abdomens. 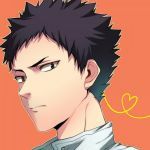 Face flushing, Iwaizumi chuckles running a hand through his black locks, his grey eyes rake over your form lingering on your baby bump as you sit carelessly on the counter in his old Tokyo University volleyball T-shirt. Iwaizumi glances next to you to see the nine by thirteen-inch pan of pie lying by your thigh halfway gone. Striding towards you, he grabs a knife cutting a chunk of pie sticking it into the microwave, waiting for it to heat. Digging out a fork, he pokes it between his teeth avoiding your scrutinizing gaze as you stare at him curiously. Everyone thought his soulmate would have been a sweet girl with a quiet demeanor who made adorable lunches, dressed appropriately, and would compliment his personality. His preference would have been that, but the vulgar statement written on his collarbone had him wracked with fear. At first, when he read that he had no idea what it meant, the wording appeared on his collarbone around the age of ten. Azumane excitedly ran to his parents to show it off only for them to gasp with mortification. Ever since it appeared, he always wore a shirt to the pool to hide the vulgar statement from prying eyes. Years later in junior high when his facial hair started to grow he finally understood what it meant and vehemently attempted to keep it hidden always changing in the bathroom stalls.